When a PTA meeting takes place, it is important that all of the attendees are able to easily follow along with everything that is being discussed. This is where an agenda comes into place, and this PTA agenda template will help you create one in a table layout that is easy to understand and use. 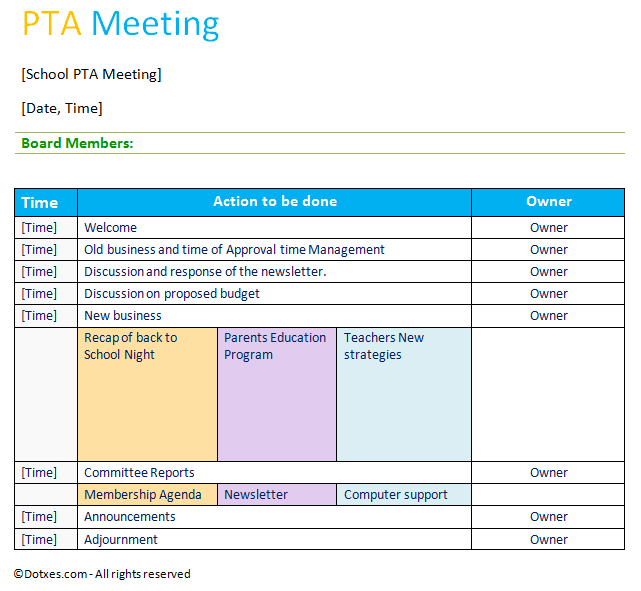 PTA agenda template includes space for you to list the board members up at the top of the page, to keep everyone current. It also includes space for the date and time of the meeting, and the school name. Using this template, you can insert a time limit for each discussion that will be taking place, in order to give the attendees a general guide of just how long the meeting is going to last. You can also list information about what is going to be discussed. If you want to keep you next PTA meeting on task and running smoothly, this PTA meeting template can help you get the job done. Very easy to read and organized..
Dotxes© is a platform of free templates for daily uses. To use these templates, you may require Microsoft Excel® and Microsoft Word® . Microsoft® and Microsoft Office® products are registered trademarks of Microsoft® Corporation. Dotxes.com is not associated with Microsoft® and Microsoft Office®. ©Dotxes 2017 - 2018 All rights reserved.